A Purple Door is a type of Door encountered in Metroid Prime. They are the second-most common type of door encountered in the game and require Samus' Wave Beam to open and begin to appear during Samus' exploration of Phendrana Drifts. Unlike their more permissive counterparts the Blue Doors, purple doors are not commonly paired with Missile Door Locks. They are commonly placed between passages in order to block unwarranted company. 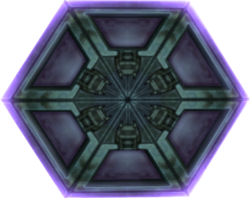 A similar type of door called a Purple Hatch appears in Metroid Prime 2: Echoes that can only be opened by Dark energy. This page was last edited on 20 July 2013, at 02:15.